The first edition of the Chicago Motor Show was held in 1901, making it one of the oldest car shows in the world. 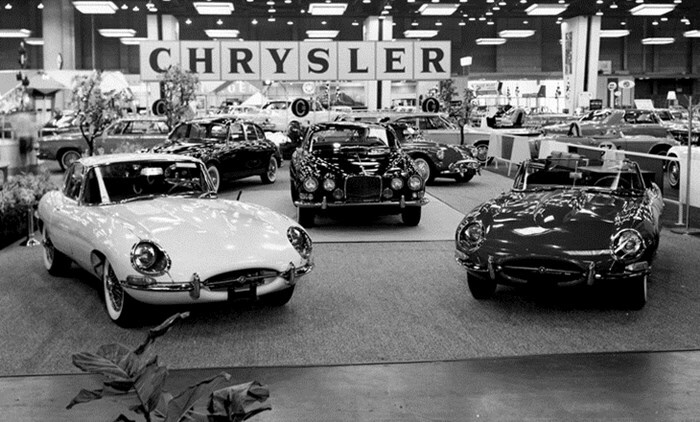 The Chicago show was once one of the nation’s largest automotive events but it is overshadowed today by bigger, more important industry trade shows held in New York, Detroit and Los Angeles. Inspired by our friends at Japanese Nostalgic Car, we browsed through the show’s vast archives and picked out noteworthy photos of European cars on display during the 1960s. A couple of things immediately stood out to us while looking through the pictures. First, many foreign cars are lumped under the “import” banner regardless of size and market segment – one of the photos shows a Jaguar E-Type, a Honda N600, a Renault 10 and a MG B GT displayed next to other. Second, many of the smaller European and Japanese brands had small, Spartan booths limited to two or three roped off cars and a sign with the name of the manufacturer hanging from the ceiling. The notable exceptions are Mercedes-Benz and Volkswagen, two companies that seemingly went all-out to sell cars in what was then the world’s most lucrative market. Finally, it’s fascinating to look at how diverse the American market was back in the 1960s. Panhard, Škoda, Citroën, Ford’s British arm and Simca were all vying for buyers’ attention. All photos courtesy of the Chicago Motor Show‘s archives. went to the motor shows back then, it was sometihing to look forward to. never enought time to see everything. VW had people in white lab coats showing spot welds. glad you did not ask use to pick just one. Interesting about the lab coats, I had no idea. Other decades will come in the next few weeks. should read ” in white lab coats who were showing how strong spot welds on VW body panels were” . they used a chisel to show that the metal around the weld would give before the weld itself. Great shots, I love the Simca displays, of course, and Renault, MG and British Ford made good showings, too. Poor Citroen, with two cars and one cheesy sign.